Intel's Mooly Eden was expected to talk about wearable technology during the corporation's press conference at CES 2014, but also moved things up a level, talking about in-body devices. "Not far away we'll see implanted devices, I think it's inevitable," said Eden. "[You'll be able] to open the car door with your thumb. I believe I'll live to see this change." Eden also believes we are on the verge of a major revolution in terms of on-body and in-body tech. "Things are moving on from the PC and laptop. It's not a carry with you, it's a carry on you. It's wearable." In terms of compute power for these, Eden took the logic of Moore's Law to demonstrate that in 12 years processors will have more transistors than there are neurons in the human brain. That represents a whopping 3.5 million times performance increase since 1970. Eden also talked up perceptual 3D computing, introducing Intel's 3D camera that fits on a module less than the thickness of two quarter dollar coins. Intel envisages the camera will be embedded into partner devices soon and demonstrated Lenovo, Asus and Dell systems with the camera embedded. The technology behind the camera is called Intel RealSense and the corporation says it is bringing "science fiction to reality" with the development. 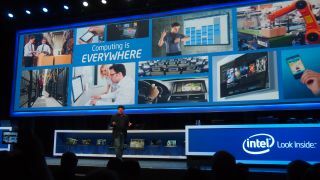 Intel announced a partnership with 3D Systems as well as Microsoft for using the cameras for Skype and Lync. The cameras could also be used to extract face and body to appear on a virtual green screen by video content creators, something that was also demonstrated during the press conference. Eden also talked about making interaction far more naturalistic and had some interesting comments on touch interfaces. "Keyboards aren't natural. Natural is about gestures and voice navigation. I would argue that voice is even more important than touch. Touch isn't intuitive because when we communicate we don't touch people all the time. You don't need an instruction book." Intel demonstrated using the 3D camera to use gestures on the Windows 8 Start screen as well as using head movements to look around a street scene in Google Street View. Intel also wanted to show off natural voice recognition with Dragon Assistant, although it didn't work first time in the demo, rather showing the challenges that more natural interfaces still face. And the fact the guy wasn't really talking naturally when he did the demo really didn't help show Intel's assertion that talking to devices is the most natural way forward.